WOW! So many replies to address in my dwindling lunch break! The majority of my hiatuses can be blamed on the mail. In all the many parts I have lying around here, I never have what I need. I'm also really picky with most things. If a solder joint is ugly, it drives me mad even if nobody else knows about it or can see it. I have all the manuals in PDF and nine printed. (All the wrong ones for this receiver.) But I've printed out the schematics and the wiring diagrams for both the 7 wire RF deck and 6 wire RF deck versions from the Issue 4 manual. The 6 wire RF deck is the manual I'm using as it has lined up correctly with what I've found until now. Can any of you guys give me a break down of the manuals? By that, I mean which manuals cover which receivers? The JX-17 versions are rather obvious, but all the others seem to be rather vague. I'm not even sure if there is a definite "this manual covers these models". I'm still confused as to what radio I actually have here. The original wiring loom in the main chassis appears to be that of a 7 wire RF deck, non-direction finder receiver, yet the rectangular block E13 is not right for that, nor does my radio have a 7 wire RF deck. The data plate says JX-7, but I can't be sure of anything. I don't even know what sort of mash up I will have when I'm done. But it will be far from an "original" design. Also, I have very dirty BC-348 (my favorite WWII vintage receiver) that will need a wash down for sure. It has spent the last few decades without a case by the look of it. Agreed Les and that's exactly what I experienced with my JX-17 and until I did the agc mod my fix was to lower the rf gain control some. Since the agc mod mine works so much better. Les you are correct, I went back and found my July 13, 2014 original response to your advise, as follows. 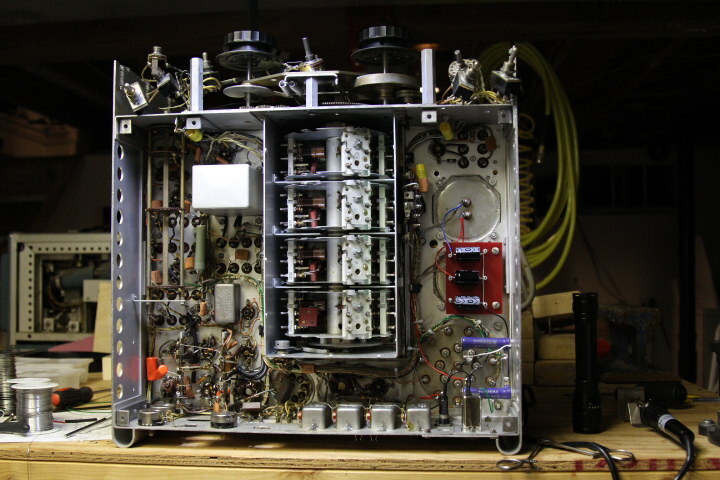 I have spent a few hours today reviewing several schematics of various versions of this receiver, and it appears the AVC of a diversity (JX-17) receiver can be easily changed to the JX-14 configuration with about than a half dozen simple wiring changes. The various values of resistors and capacitors in the grid circuits are identical so it seems to be just a matter of "re-plumbing". So it's the JX-14 AGC I put into my -17, not the JX-10 version as I stated earlier. I still like the radio a lot, its setting on the operating table and it gets used at least a couple times a week. Which schematic is the JX-14 version? I've heard a lot of people say they use that AGC circuit, so I suppose I may do the same. I guess it depends what I think of the performance the way it is currently. The schematic and wiring diagram I am following is from the supplement A in the Issue 4 manual that applies to J and JX models 21-26. Anyway, I have put the side panels back on the receiver and have finished the rewiring. I installed R72 and R73 and wired them up as well as replaced the RF gain control wire. That about ties up all the lose ends. I have yet to replace the 10uf bathtub caps, but I figure I can get away with a power up test before tackling them. They will be an easy job. 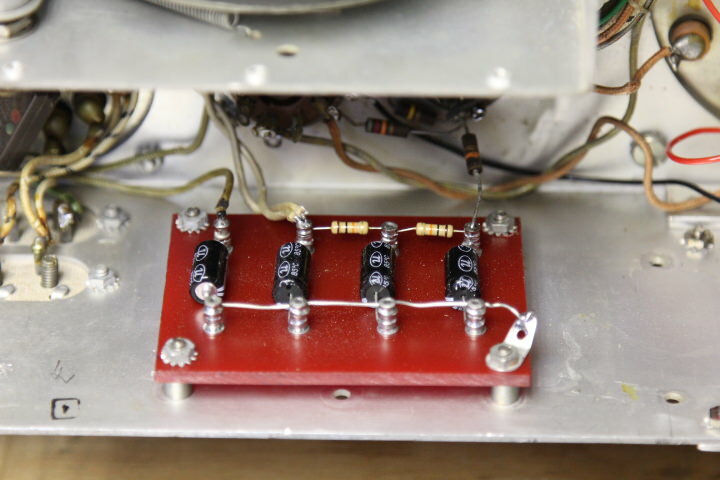 I am also still missing the IF transformer for the cathode follower, but I may be changing that a bit for use with my SB620 hopefully, so not much point in restoring it to original. There are also the BBODs in the band section that will have to be replaced, but again, I'm going to wait. For now, I'll not test out those bands. Here's a pic of the power supply section again. And one of the whole chassis. Tomorrow I will go through the tube socket resistance chart and if everything is in the ballpark, I'll try a power up again. I also know that the Rec/Send switch is bad. No matter the position, it is always open. I tried flipping it back and forth a few dozen times and wasn't able to get it to close. All the switches on this receiver are in rough shape. Carling makes some good looking ones with short levers that would match the SP-600 quite well. I'm sure there's more to say, but I'm tired to the point of feeling inebriated so I better just go to bed. Thank you all for the kind comments and tips! 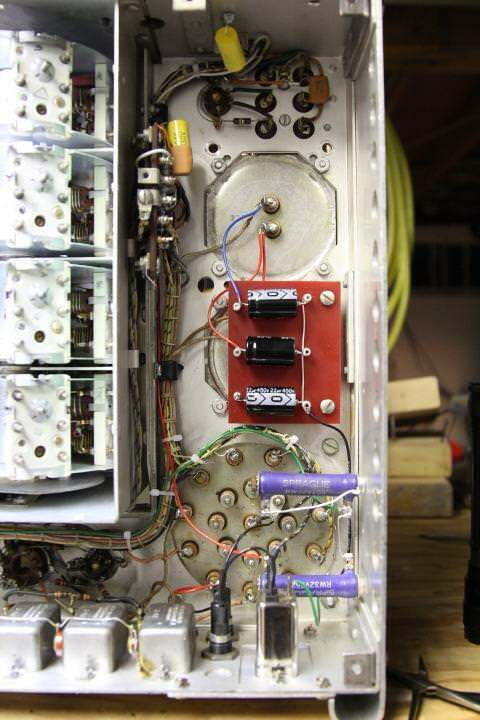 Once you have the receiver properly working and correctly aligned try receiving a strong local 50KW AM station a few miles from your home with a good antenna connected to the receiver. Provided you have an AM station that close if you hear no distortion at all with agc on and rf gain fully cw then you are good. Concerning the electrolytic caps including the bathtubs my JX-17 is either running just fine on the originals or later depot replacements so you might leave them alone, but YMMV. The nearest broadcasting station is 25KW and about 5km away from here. I have seen a lot of people leave bathtub caps. I have done the same before. It seems to be a common opinion that they age well, but I know that's not always the case. I have had a few fail spectacularly. I love the look of them! They're one of my favorite old capacitor styles! If you have a part 15 AM transmitter connect a long wire antenna to the Hammarlund maybe 30' and place the transmitter in the same room. 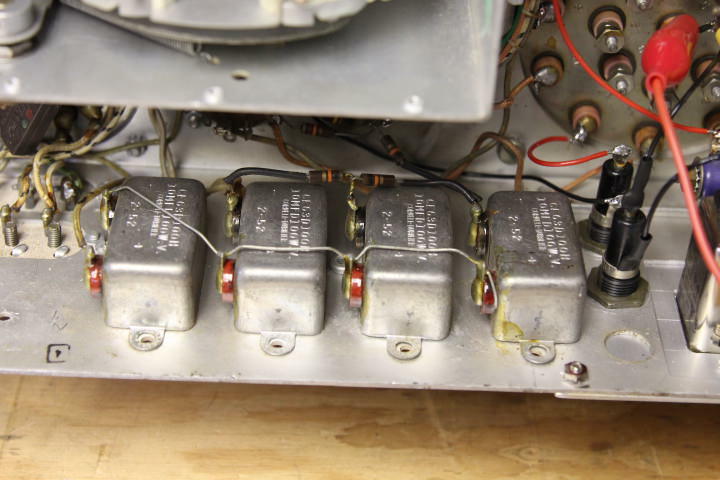 The transmitter should be enough to make the receiver overload at least with my JX-17 it did. I gotta get the radio to work before I have to worry about all that anyway. I did the power up test and the radio is not working yet. All tubes light, I get B+ at the send/receive switch, I get a 60hz hum from the headphones when I touch the audio gain pot shaft, and I get more hum and a small deflection on the meter in the audio position. 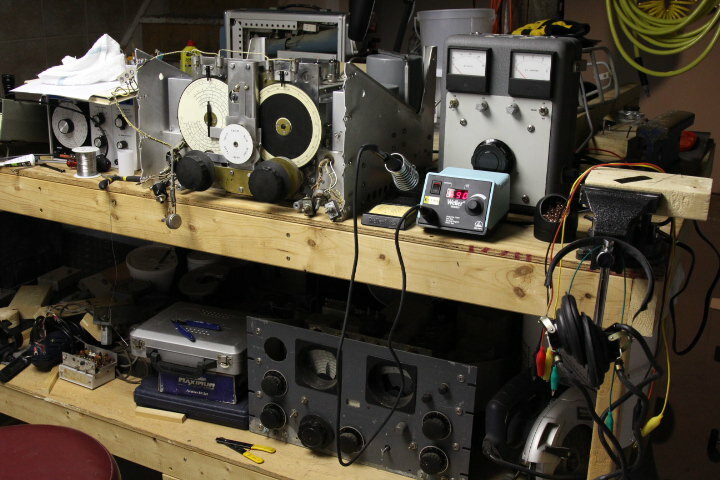 Time to get the test equipment out. The diagram you want is contained in TM11-851 and it is figure 101. AKA R274C, mid serial numbers. It is the only variant which had V1 and V2 Screen B+ as a separate (the seventh) wire. Go to James Morer's site and get the document "SP-600 IDENTIFICATION GUIDE" Oct 4, 2004. You might also consider getting a print copy of the 11-851 manual, from ebay. The 3 foot, or so, long schematics are a real help. I re-stuffed all the bathtubs in my SP-600 JX17. I think I did it for my SP 400 as well. I am over that sort of thing now. I just find a discreet place to add new caps and leave the tubs where they are. 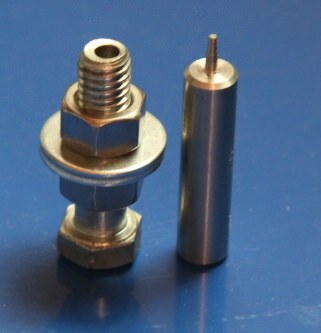 You will need a tube base extender for testing the pin voltages at the RF deck. I think I pulled my RF deck three times, but it could have been more. After the first time, I made a real careful project of getting all the tuning capacitor connections just the way I wanted them so they would be easy to solder and unsolder. Same with the connections under the cover on the crystal oscillator side. Thanks for the info, Mike! I have the TM11-851 in PDF and printed out with large schematics from Andy. I know what you mean, Norm. I used to restuff capacitors, but I don't bother anymore. I don't leave the old ones in though. I often put the new ones where the old ones were but try to find an elegant way of doing so. Turret boards are my new go to method! I will be replacing the bathtub caps in this receiver. After half an hour or so, they started to get quite warm. Warmer than a capacitor should get in my opinion. I also did a little more digging into this SP-600. I went through and tested the voltages on most of the tubes and found them all to be within 10% except the BFO tube which does not appear to be getting any voltage. I have yet to test the RF deck voltages and that of V6 and V8. I have found that both audio sections work. At least, I get hum probing the inputs. I was fairly certain of that when I started as I was getting similar hum when touching the audio pot. While tracing the signal path, I realized that I had not reconnected the wire from V15 to the Diode terminal on the rear and hence the jumper I had put there was doing nothing at all. But that didn't make things any more lively. The radio is still pretty dead. I'll do the rest of the voltage tests tomorrow and then maybe try to trace the lack of BFO voltage. Maybe that'll lead me to a break through. I also plan to make up a turret board soon and replace the bathtub caps. That way I can eliminate one more source of potential problems. Go to James Morer's site and get the document "SP-600 IDENTIFICATION GUIDE" Oct 4, 2004. I can't seem to find a file by that name on his website, Mike. Does it go into more detail than other places that list the different models? I spent the day slaving away on this radio yet again! I figured now was as good a time as any to replace the bathtub caps. I did things the same as the power supply caps. I made up a turret board and mounted it in the original location of the bathtub caps. I'm sure I will use turret boards for most if not all of my future recap jobs. They may be more work than simply using turret strips, but they look so tidy and fit the rest of the radio well. I have now replaced every capacitor on the chassis except for ceramic and mica caps. All that remain to be replaced are the few in the band turret coil sections. With the bathtub caps out of the way, I went ahead and powered the radio up to poke around in it some more. I set my signal generator to 455kHz with around 50% modulation with a 1kHz tone and probed various sections. It seems that the detector and IF strip are working correctly. 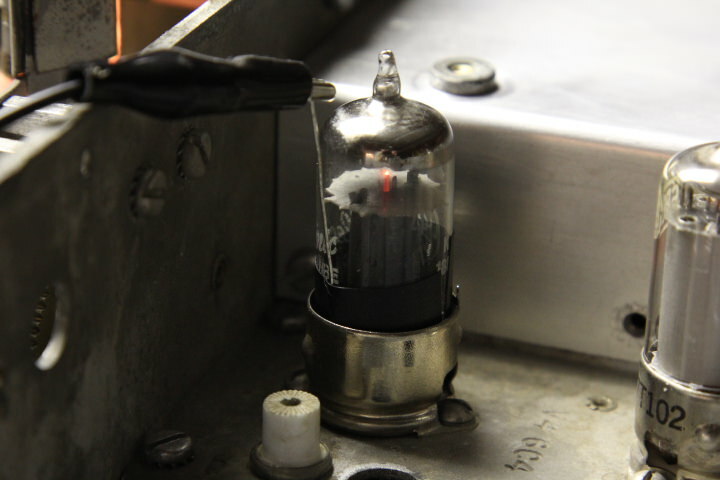 I got a tone in the headphones with the signal going into the grid of the 2nd mixer tube. I don't have a set of tube extenders, so testing the RF deck will be more tricky. I figure I should be able to pull a tube and test for anode and grid voltages. I suppose they may not be accurate without the tube in the circuit, but I'm just wanting to know if they are there. As for inserting signals or testing for the presence of others, I thought maybe I could use a thin diameter buss wire wrapped around the desired tube pin and brought up to the top of the tube? A little electrical tape or something to keep it from shorting on the ground collar. Seems like it could work to me. I definitely should invest in a set of tube base extenders though. When I can afford them that is. NICE WORK, on the turret board, where do you get the phenolic material and turrets? What do you use for a flaring tool? And thanks for your comment! This is only my 2nd turret board ever, but I've fallen in love with making them! They are fun to build and wire, they keep things neat, and they are very simple. I'm going to use them all the time now. The staking tool is one of several that I made myself. I tried blunt conical tools to flare the protruding ends of the turrets, but I found that they were not tight enough. They had some wobble. So I went with a narrow cone with a slight taper to be inserted into the turret and widen the part inserted into the board. I could then use one of the more blunt tools to flare the ends, but I feel it's not necessary. The bolt is drilled to the turret diameter (a little larger) and just deep enough so that the end rests at the bottom of the hole. I mount it on the platter of my drill press and chuck up the staking tool to use the drill press as an arbor press. Since the staking tool is machined on my lathe, it's a little rough, but that plays to my advantage. The turrets have a habit of getting stuck on the tool but a small rotation of the chuck screws it out thanks to the fine spiral machining grooves. Thanks again for your kind words! I'm very proud of my turret boards! All two of them! I failed to mention in my post yesterday that the 3.5mHz oscillator is working. I probed it with my frequency counter and it is at 3.5006... After reinstalling the dial pointers and such, I tested the 1st local oscillator and found it to be working on four of the six bands, one of them didn't work because it's still removed. That's the 1.35-3.45mHz band. The other band that it didn't work on was the 7.4-14.8mHz band. I don't know why it didn't work, but I'm gonna guess there's a problem in the oscillator coil section for that band. I'll dig into that later. I used a piece of buss wire wrapped around the tube pin and taped to the side of the tube to bring the necessary connection to the top of the chassis. Just the way I said I would. I'm currently talking to a friend about tube extenders. He says that he figures he has some spares somewhere and would be willing to sell me some. Here's a pic of the jury rigged tube extender! 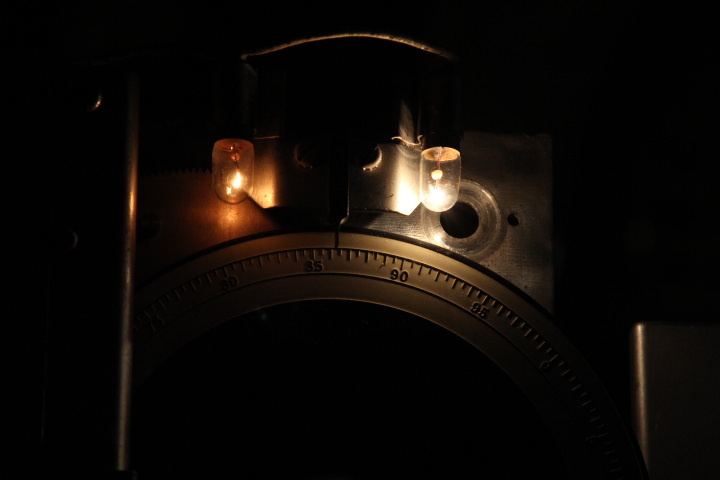 I also reinstalled the dial lights and found that the bulbs were all 28v #313 bulbs instead of #47 types. Right from the get go when I powered them up they looked very dim. Kinda neat though! Here's a comparison with a #47 on the right and a #313 on the left. I'm beyond eager to get this radio working correctly. Sitting in front of it this evening in the dark basement with those dim #313 bulbs glowing and the frequency counter tracking the oscillator while I spun the tuning knob, I just felt so close. But I'm not there yet. Hopefully by this time next week! I just finished refurbishing a 600 JX-1 which I just purchased from Joe Ryan an ARF member. After replacing all the caps, out of tolerance resistors and repairing 4 broken rf deck contacts the receiver was deaf when I fired it up. I used the signal substitution section of the army manual to trouble shoot it. It had a miss wired CW/MOD switch, a disconnected 7PF coupling cap on one of the tubes and a broken coil wire inside the T4 transformer. After repairing all of the above it came alive. Any way I would recommend the signal substitution section of the army manual as I am not smart enough to trouble shoot on my own. Good luck as yours looks looks great and I am sure it will perform well when you get it going. Thanks for the info, Koby! I am still familiarizing myself with all these manuals and that comprehensive troubleshooting section of the TM11-851 certainly will come in handy some time! As for my particular SP-600, she's working! I came home on my lunch break and decided to look at the MOD/CW switch. I had been meaning to do that days ago but kept forgetting. One of the sides of the switch was wired incorrectly. Both wires to the center terminal. I didn't test the radio after correcting that, I just walked back to work and figured I'd do more trouble shooting later. When I came home, I put the signal generator back on the grid of the gate tube and tuned it to 455kHz. When I put on the headset, I could hear the modulated tone, but something was different. I was getting static this time that I had not heard before. I was instantly excited! Static is a good thing!!! Sure enough, I put my finger on the antenna terminal and the roar of static in the headphones was deafening! I don't think the MOD/CW switch had anything to do with it. It was just the side that goes to the meter. I'm not gonna try to cover it up, I think the problem the whole time was a dirty selectivity switch... I had moved it through its positions when injecting a signal in various stages, but I guess it never quite made good contact. The first thing I'm going to do now is clean that switch! Probably the most common problem with any piece of older equipment is that of mechanical contacts, be they tube sockets, rotary or toggle switches, cable connectors, or any other type of movable contact. First thing, after verifying there aren't any imminent power/smoke issues, I vigorously exercise all the rotary/toggle switches and pots from end to end several times. Next, wiggle all the tubes in a rotary fashion in their sockets. This 45 or so seconds will improve your chances of early "signs of life" very significantly. Once you have verified "life" the rest is all down hill. Not to minimize all the work that may lie ahead, but at least you know it "works". Yeah, normally I clean open rotary switches like that as one of the first steps, but this time I only exercised it a bit. I guess that wasn't really enough. At least it's working! I'm happy about that! While listening, I also found that the radio worked on the band that appeared to have a non functioning local oscillator when I tested it before. It could be that the signal was just too weak for my frequency counter. I use and old HP 5381A and I find that it needs quite a strong signal to get a reading. Since then, I haven't done much. I decided to try and trace the lack of power to the BFO and found that the switch is intermittent. So far, that's two bad switches and judging by the poor solder joints on the MVC/AVC switch and the fact that it is not a short bat like the others, I'm quite certain that it is also a replacement. On top of this, the RF/AF switch for the meter is very rough in its operation and it sounds as if the internal rocker is not functioning properly. I think what I will do is replace all the switches as to mitigate the possibility of them failing in the near future and that way I can buy the same brand and style and make everything match nicely. I already know the type I will use. Carling makes short bat (1/2") toggle switches in SPST, DPST, DPDT, I plan to buy a handful of each. They will be quite similar to the originals. That's about all for now. This thread is growing quite long and I feel like I've barely started! I hope I'm not being too long winded! IMHO not at all. I enjoy this style of "conversational" posting, makes the thread more interesting.